The Central Coast is now one of the top destinations for weddings. With its’ gorgeous beaches and romantic wine country, no wonder it is the “IT” place to tie the knot. This Sunday April, 9 2017 in San Luis Obispo is the Madonna Inn Bridal Show, from 12-4. It is a perfect place to go and meet people who you will want to hire for your special day. Many companies will offer discounts if you sign up for their services at the show. What could be better, every service a bride would want under one roof! Don’t miss this fun event! Golden Event Staffing of San Luis Obispo will be there in space B14. 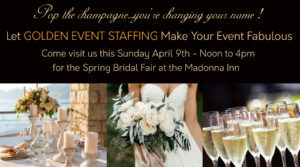 Come on by for a sip of bubbly and learn how we can make your event fabulous!